I finished Stiff by Mary Roach and have started Lives in Ruins by Marilyn Johnson. Nonfiction is where it's at. I feel inspired to extend Nonfiction to November to Nonfiction THE REST OF 2014! Perhaps Nonfiction 2015? I don't know, I'm just really nerding out on the nonfic right now and it's incredible. America just celebrated the national holiday of cooking: Thanksgiving! I cooked at home for my immediate family. There was one wee disaster involving a melted thermometer but everything was golden after that. We had a very traditional turkey dinner, including a spicy corn casserole that is my all-time favorite side dish. I hope all of my American friends had a great holiday and that my non-American friends enjoyed the millions of food pictures on Instagram. We had to have our furnace worked on. Isn't it just the best when you have to drop a big chunk of change on a home repair right before Christmas? I recommend it, har har. I didn't head out on Black Friday and I sure as hell didn't shop on Thursday. I think the only way to stop the consumerism madness is for more of us to stay home. I'm doing my part. It's not even the proverbial drop in the bucket, I know that. But I feel better about myself when I don't participate in the crazy. There's nothing wrong with wanting that great deal. There is something wrong about minimum wage workers being forced to work on a day we are supposed to be filled with gratitude for the things we already have. Gross. I talked about my Christmas baking traditions and shared a recipe for cutout cookies in a guest post on I'm Lost in Books. Thanks so much for asking me to participate in your Holiday Extravaganza, Becca! Christmas decorating and baking and music and wheeeee! It's almost that time for me. I can feel the spirit coming. It's not quite here, but it's close. 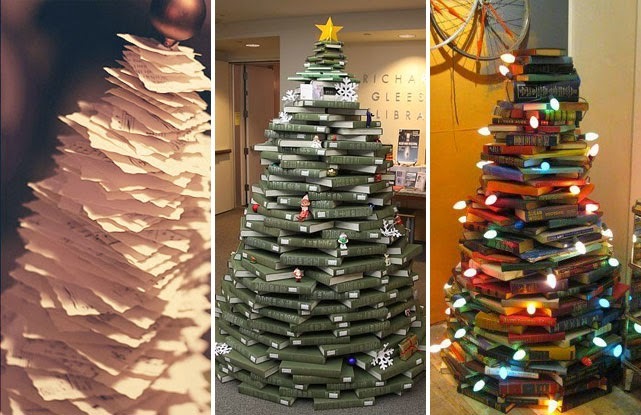 Are any of you attempting a bookish tree this year? 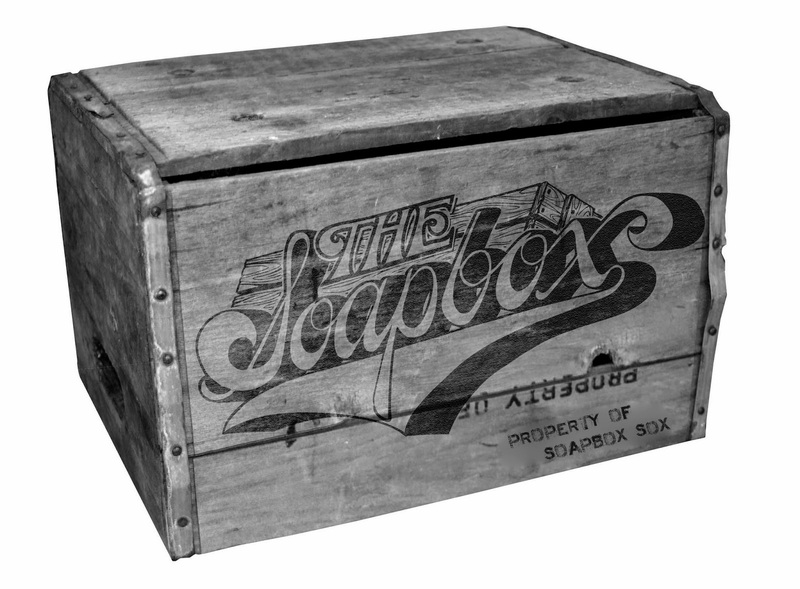 If I can figure out where to put one I might just give it a whirl myself. New kittens and trees don't mix. 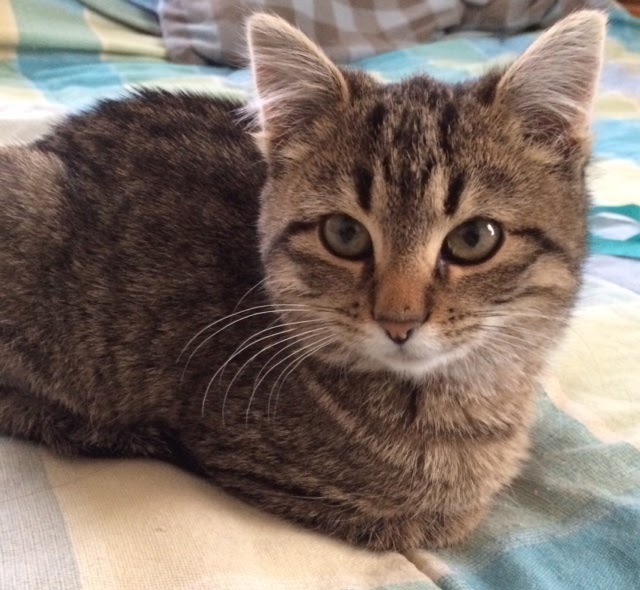 Come to think of it, new kittens and piles of books don't mix either. Hmmm. Aren't they fun looking? One of these years I'll make it happen. Darn cats, lol! On the flip side...sadly, some people have to work to get by. No, they shouldn't have to, and the minimum wage should be higher, much higher. I don't think I've heard of this spicy corn casserole of which you speak. Tell me more ;). I didn't go anywhere either Black Friday or the rest of the week either (had off starting Wednesday and it's been mostly reading and watching Criminal Minds). The casserole is to die for. I can arrange to share the recipe if you're interested! Awwww, Myrtle. And that pic of your kids looks great!! I haven't shopped on a Black Friday since... I can't even remember. Late teens, early twenties? I just hate the crowds and enjoy staying home and decorating SO much more. I've done the Black Friday thing. It's kinda fun if you make an event of it. But on Thursday? That's just crazy/sad/gross to me. No thanks. I completely agree about wanting to extend nonfiction November! I have been thinking the same. I went light on nonfic all year and now I'm overloading! I don't think I read quite as much nonfiction this year either. Hmph, how silly of us! Now I don't want to stop. Let's keep it up! Since I have two nonfiction library books out, I'm totally extending #nonFicNov! I lucked out, my teen daughter decorated one day while I was at work at the bookstore. Maybe I'll talk my boss into making a book tree at the store! I'm with you on wanting to extend Nonfiction November! I participated for the first time this year and loved it - it was just the motivation I needed to refresh my reading this year (which ad been mostly fiction). Now I have so many TBR books from it that I might do some nonfiction January. The corn casserole also looks/sounds delicious! I make a sweet corn bread pudding that sounds a bit similar. Mmm, I love cornbread and cornbread pudding sounds right up my alley. I sense a recipe swap in our future! I'm normally a 100% hermit on Black Friday (we even stayed in our PJ's for Thanksgiving this year! ), but our coffee machine died on Thanksgiving so it was an emergency that called for braving the crowds and buying a new one. We made it back in one piece. Love the picture of the kids!! I saw that you were in your jammies on Thanksgiving and it sounded so good! Oh my word, I would have went out at ANY time of day or night if my coffee pot died, lol, can't blame you for that one bit! Love the name!!! Keep the pictures of Myrtle coming! Here, here on Black Friday consumerism! Jim went out to get dishwasher tablets because we had none and the dishwasher was beginning to smell funky. Otherwise, I refuse to shop for anything related to the holidays on Thanksgiving or the Friday after. Christmas is not about buying things, and as we creep into Thanksgiving more and more, it disgusts me that this seems to have been completely forgotten by both stores and consumers. What has happened? I know so many people who just hate what it's all become but the consumerism just keeps rolling on. I wish I knew what do to. I guess staying home is the only thing we really can do. Sigh. I know. I would love to have done a before and after poll to find out how many people complain about consumerism during the holidays but went out shopping on Thanksgiving or woke up early for Black Friday sales. I fear that the number of people who did both would be appallingly high. Books are a completely different thing, lol! I agree completely that we need to stay home to stop the madness! I'd rather have a sharp stick in my eye than shop on Black Friday. The family photo is wonderful! LOL, I completely understand! 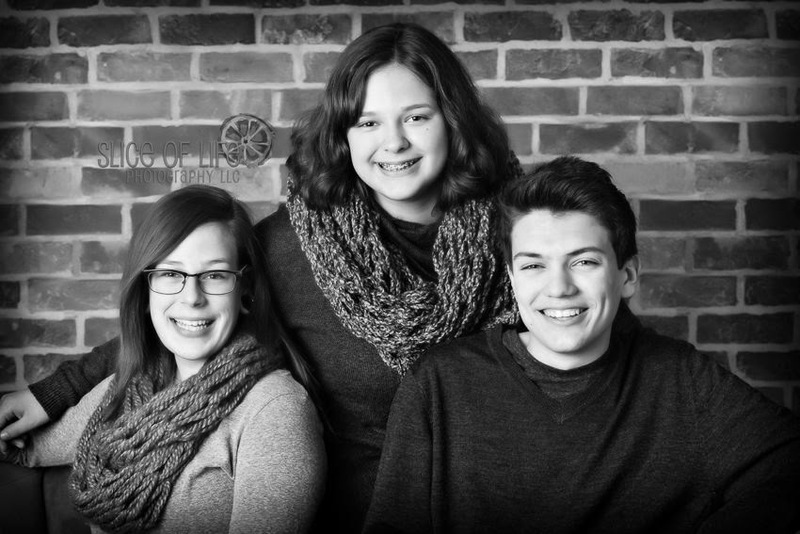 Thanks so much, I'm so glad to have finally gotten those kids in front of a camera ;) It's hard to get them all in the same room now that they are so darn old. That photo of your kids turned out awesome!! 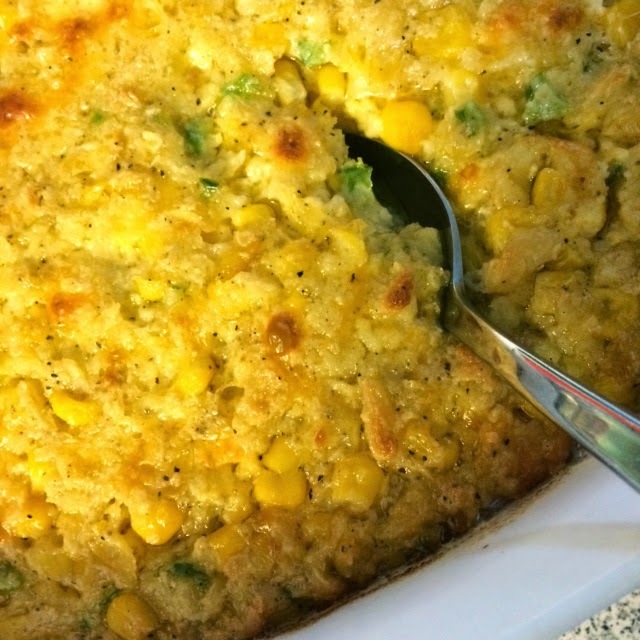 Can you share the corn casserole recipe? It looks good and I like spicy. Thanks so much, Ti :D I was so happy to finally get a nice photo taken. Usually I'm scrambling to take one with my phone at the last second, lol. I hope you make, and love, the corn casserole. YUM.